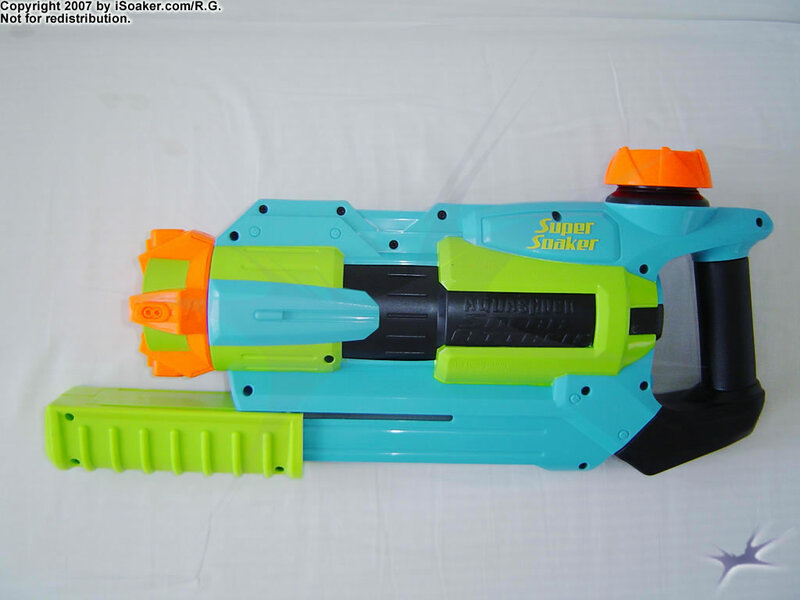 The Super Soaker Aquashock Sneak Attack puts an interesting twist to the standard Power Soaker-type Super Soaker design by Hasbro Inc. 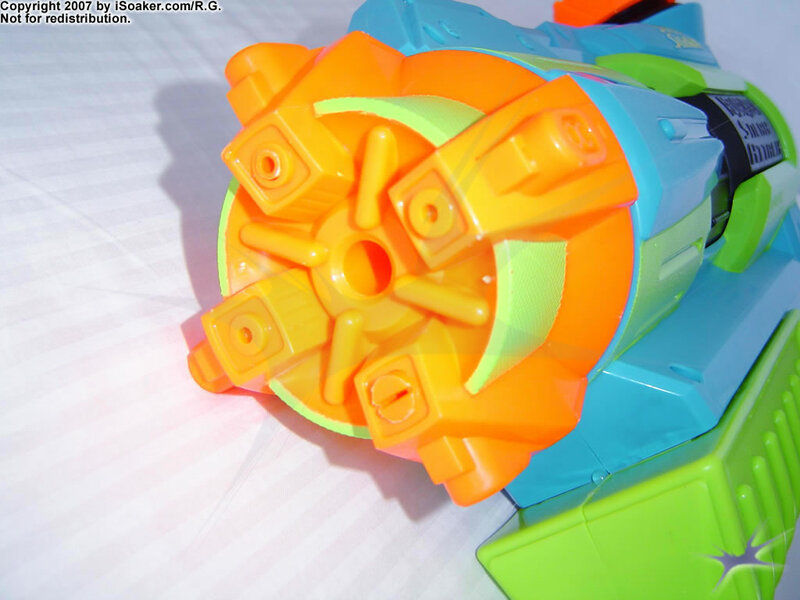 Roughly the size of the Super Soaker Helix, the Sneak Attack features four different nozzle settings, two of which give the Sneak Attack its name. The Sneak Attack features four different nozzle settings on its nozzle selector: forward stream, left stream, right stream, and fan blast. Depending on the selected nozzle, the Sneak attack is able to target opponents in front, to the left, or to the right of the direction the blaster's body is facing. As the overall appearance of the nozzle selector appears symmetrical from a distance, it is not immediately obvious to an opponent which way the Sneak Attack will shoot until the stream actually appears. All the stream settings have a good feel to them while the fan blast offers wider area coverage at the price of range. The streams are powered directly from the pump, thus overall stream performance is also affected by the strength of the user. The pump on the Sneak Attack performs well and pushes a slightly-above average, but respectable amount of water per pump. The pump, itself, is tracked and feels rather sturdy. 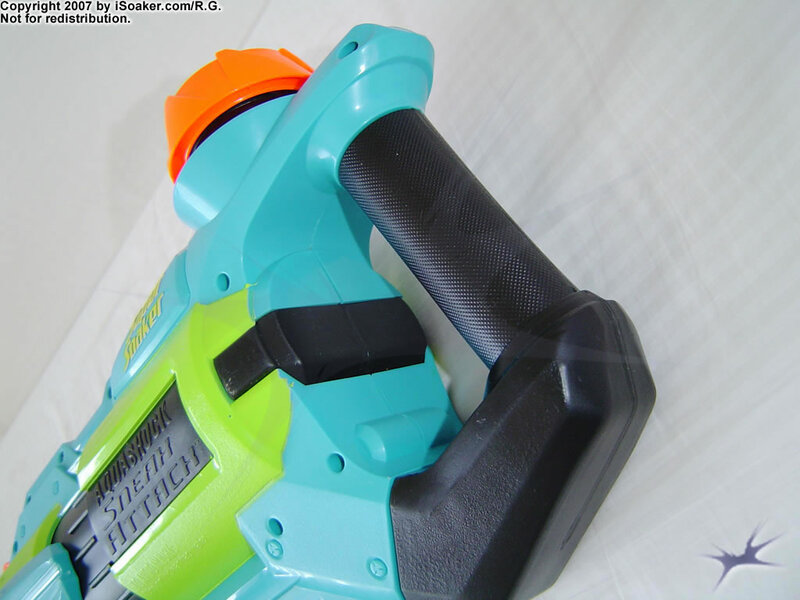 It does stick beyond the front of the soaker when extended, thus a little care should be taken not to drop it when the pump is in the forward position. The grip area is fairly spacious and comfortable to hold. It is also part of the reservoir, thus may feel slightly cooler to the touch if cold water is used to fill the reservoir. Its textured surface makes it easier to hold, even when wet, and its size should be large enough to accomodate all but the largest of hands. The reservoir on the Sneak Attack holds a good amount of water for a blaster of its size. Being rear-body mounted, a filled Sneak Attack only feels heavier, but just as nicely balanced as an empty Sneak Attack. The reservoir is capped with a Max-Infusion compatible cap, thus allowing one to extend one's available water nearly three-fold if a 3L (100oz.) Max-Infusion Aqua Pack is attached. 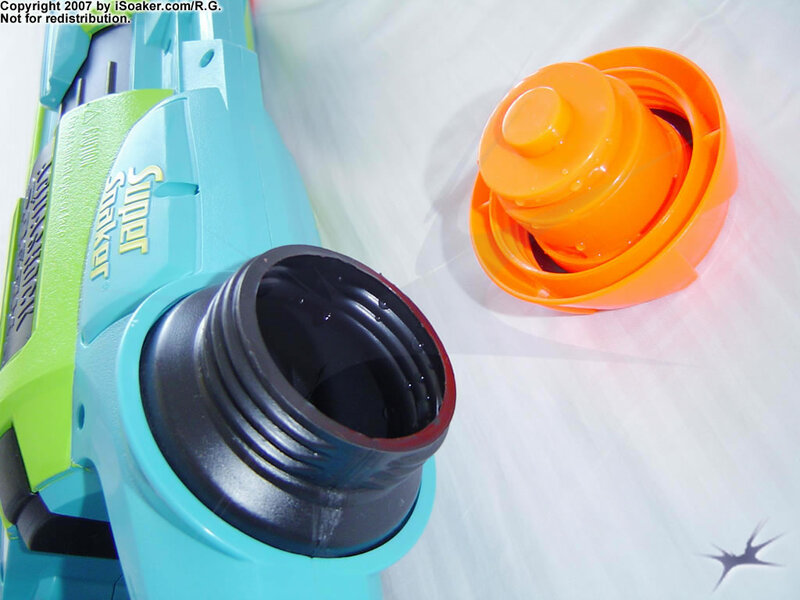 As a whole, the Super Soaker Sneak Attack is a great, decent-sized pump-based soaker. Its different nozzle settings allow it to fire in-line or perpendicular to the soaker, allowing a Sneak Attack user to surprise their opponents. Stream performance and general soaker construction feel quite good. However, maximum stream size and output are limited by the nozzle size and total pump volume. Thus, while this blaster can hold out well against other soakers of similar sizes, a Sneak Attack user should remain wary of larger soakers. Pump and shoot; no prepressurization necessary. Different nozzle settings allow for interesting angled attacks. Streams quite smooth and solid with nozzles seeming slightly larger for a blaster of this size and type. Pump volume limited. Stream no continuous, limited by pump volume. No strap. The Sneak Attack is a great soaker. It has 4 nozzles which all have their own usefullness. One nozzle shoots forward with quite a bit of soaking power! 2nd and 3rd nozzles shoot to the left and right side. Sounds like a gimmick, right? Wrong. Nozzles 2 and 3 have proven their usefulness in battles. There's also nozzle 4, a fan blast. I don't find that useful at all. The blaster is pretty light compared to other blasters of this size, not sure of exact weight, though. Overall, I recommend it to anyone who wants a smallish soaker with good soaking power. I don't know how many people will agree with me on this one, but I find this blaster very durable. It has been dropped many times and still works like new (Although that new super soaker smell has worn off.) I currently own 2 because, seriously, the reservoir size is small. However, when this gun is paired up with my Flash Flood, the team can cause some serious soaking. I'd give it an 80%, which, ironically, is its overall rating. Another possibly contreversial thought here, in my mind, this gun could easily replacement for the Scatter Blast. Right? Probably the best piston blaster I've used. Makes a good primary or secondary. Has decent range, and delivers a lot of water for a piston based blaster. The sneak attack feature is actually really useful. Overall, a good blaster. Not the best for a side-arm, because it's quite heavy. If you are looking for a good piston-based side arm, go with the EES Sonic instead. This gun is great for novices, but also a great primary or secondary for the pros. The classic sneak attack never gets old. Sneak Attack mode also allows for me to shoot over a wooden or concrete block fence when holding vertically. Great for corners. Definetly would reccommend to friends or anybody. A bit overpriced in some Target and WalMart stores at $14.85 USD, though. Online deals will allow you to save. This gun is an intresting one. Its Sneak Attack nozzles I think have been critisized too much. I think that a side shooting nozzle is a good idea if you are fighting in a place with a lot of corners to peek around like I usually do. If you don't, well that's not my problem. Anyway, this gun is fairly cheap at around 10$US, which is, in my opinion, a resonable price. If you need a reliable sidearm, this is an excellent choice. It has resonable power, and the sideways shooting nozzles are useful for cornery places. And if you add an Aqua Pack, it can be used as a light primary weapon. Final Words: If you have 10 bucks to burn, buy this gun. If you have 15 bucks to burn get a Tiger Shark. Review: First of all, this Super Soaker is categorized wrong. It should be in the "Piston Pressure" series. (iSoaker.com Note: This is now corrected. Thanks!) Aside from this, however, this is a decent water gun, medium in most categories, and by no means a powerful drenching weapon. It has four nozzles: A regular, 20-ft. stream nozzle, a left and right Secret Strike nozzle, which shoots a stream similar to that of the regular nozzle out at a 90 degree angle, and a fan nozzle. Range on these nozzles is limited by the strength of the user, but a good pump can get about 20-25 feet. The Secret Strike nozzles are good for novelty value, but are cumbersome to switch into during the heat of an intense water fight. Overall, the gun is medium in all respects and would make a good sidearm, probably to be backed up by a CPS-series Super Soaker.